Comics God Grant Morrison's latest work is Batman, Inc, a future-corporate re-imagining of Gotham's Dark Knight. One of his key inspirations for the series? 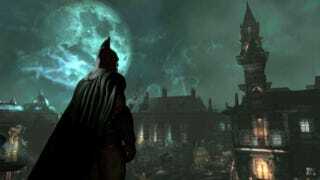 Last year's Batman: Arkham Asylum video game. While Morrison's respect for the medium - and even its role in getting Batman, Inc off the ground - are well-known, it's still a little strange hearing that a new Batman comic is being inspired by a Batman video game that was itself inspired by a Batman comic. One written by Morrison, no less. "One of the things I wanted to do was capture the feeling of the Batman: Arkham Asylum game that came out in 2009", he tells Wired. "When I played that game, it was the first time in my life where I actually felt what it is like to be Batman. It was very involving. The way the game and Paul Dini's story was created, crafted and shot made you actually feel like Batman." Morrison says that's the great thing about games: unlike movies, where we're watching somebody else be Batman, if a game does its job you can not only be Batman, but craft his story along the way with your actions. It's a theme that carries through to Batman, Inc, as Morrison says a key concept of the comic is the fact that "we are now the heroes, and we can look through their eyes." Pop will eat itself? More like Batman will eat himself.